Raise your hands if you love brownies. How about Oreo cookies? Well, today I’ve combined the two to create the ultimate brownie recipe. You are absolutely going to LOVE these! These brownies are super thick, fudgy, and rich in flavour. I’ve stuffed them with whole Oreos, and topped them with broken ones. Perfection. These brownies are requested quite a lot, but I don’t mind. It means I get to have a few every time I make them! 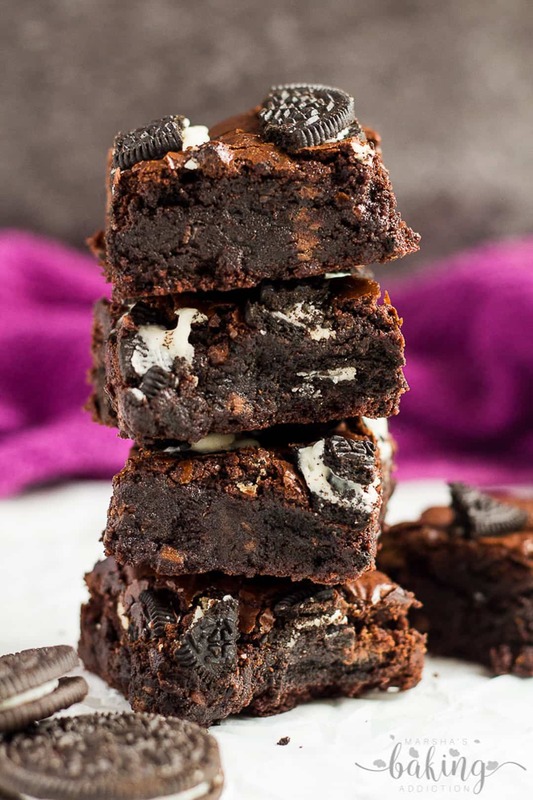 You’ll need 16 Oreos to fill the brownies with, and about 4 – 8 broken Oreos to place on top. Yup. 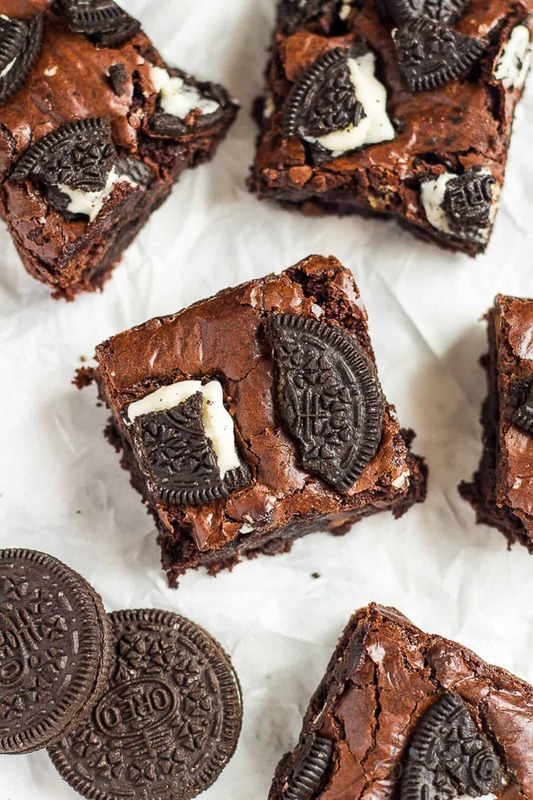 These brownies are FULL of Oreos! To make these brownies, simply make the brownie batter as instructed, then pour half of the batter into an 8×8-inch square baking pan. Place 16 whole Oreos on top, then pour on the remaining batter. Top with broken Oreos, then bake for about 30 – 35 minutes until a toothpick inserted comes out clean with moist crumbs. Allow to cool completely before cutting up into bars – if you can wait! 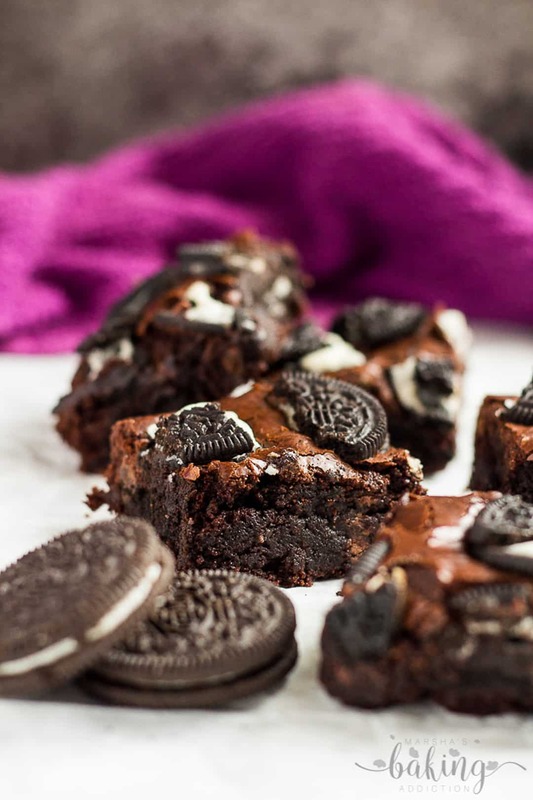 A simple, one-bowl recipe, these Oreo brownies will be prepped and out the oven within 1 hour. Allow to cool completely before slicing into squares. Want a change from brownies? Try my blondie recipes! 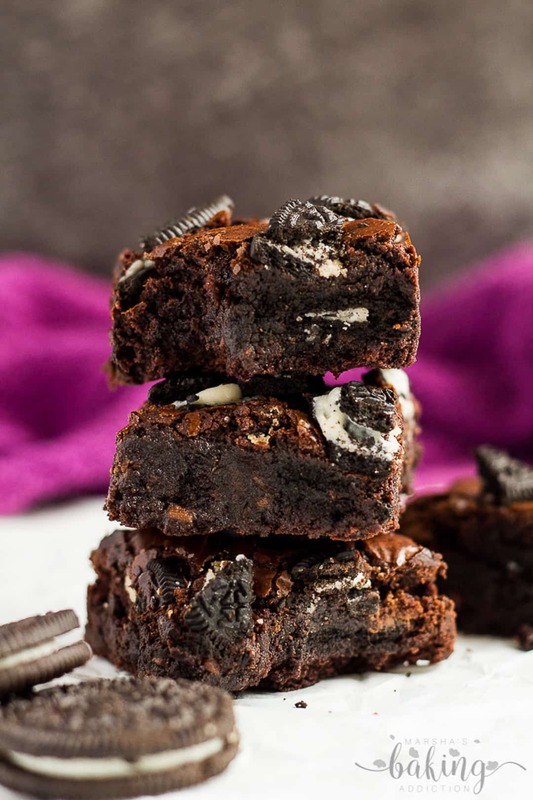 Deliciously thick and fudgy brownies that are chocolatey rich, and loaded with Oreo cookies! Pour half of the batter into the prepared pan, and spread out evenly. Place the whole Oreos evenly over the batter, and top with the remaining batter. Top with the chopped Oreos. Bake for 30 - 35 minutes, or until a toothpick inserted into the centre comes out almost clean with a few moist crumbs. Allow to cool completely in the pan on a wire rack before cutting into squares. Heaven in edible form. There’s an alternate name for you, just in case you ever need one. But for real, I cannot get over how good these look! NEED to try them soon! These look incredible! Brownies are such a delicious and decadent treat – the addition of Oreos would only enhance their wonderful chocolate-y taste! I made these today and they are unbelievable! We served with ice cream on top! 😉 The Oreos inside AND on top made the brownies THAT much better. Thanks for sharing your recipe! I plan on making again for lots of upcoming get togethers! I use Dr. Oetker Fine Dark Cocoa Powder which I believe is Dutch-processed. I also love Green and Black’s! Thank you! I’ll check out those brands. I made these tonight using regular cocoa powder not Dutch, so I’ll see how they turned out in the morning. I know sometimes using one type of cocoa versus the other can make a difference in the final product. They smelled great though!! It certainly can, but I always stick to this cocoa powder for whatever I’m making 🙂 Enjoy! How did it come out with the regular cocoa powder? What type of chocolate chips do you use? You can use any you like – your favourite ones 🙂 I typically use milk chocolate. Absolutely amazing. I made these today and adapted to make dairy free for my son. Such a quick and easy recipie. Thankyou! 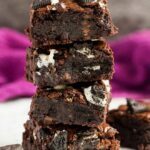 Love these brownies so easy to make and the Oreos take them to another level. I used cheesecake Oreos crushed on top of the brownies does this matter? Have you tried making these in a 9×13 pan? I’m going to try them for a potluck so will need a larger serving. Im planning on doubling the recipe, what would be the baking time if i use a 9×13 pan? Super chocolatey brownies that are perfect for a chocolate lover. Everyone I made them for raved about them. (Personally, I could only have a bite because of the richness.) Overall I say that they were a complete success. I’ve just made this recipe with some small modifications and it’s SO tasty and easy to made. Two questions: am I supposed to soften the butter first before I combine it with the sugar, cocoa, and salt into the microwave? I’m accustomed to baking with semi sweet chips. I didn’t see semi sweet in the ingredients. Am I supposed to use regular chip? Haha, it’s definitely hard to share these brownies! This is my new favorite brownie recipe. Absolutely fabulous. Isn’t it too much sugar a cup and a half? As the brownies are very sweet with the Oreos and chocolate chips? You also found this was too much sugar, thought it was just me getting something wrong, would it make much difference to put in less sugar? I dont have large eggs. How about if I add 3 small eggs instead? I tried these out today and they turned out so well!!! Thank you so much for the recipe!! My sister hasn’t stopped devouring them!! WOW! Hoping to make these for my daughter’s Brownie Troop. Can you please confirm only 1/2 cup of flour is correct? Thanks! That’s correct! The little amount of flour is what makes these extra fudgy 🙂 Enjoy! Thanks for confirming flour amount! I made these with Double Stuffed Oreos and Semi Sweet chocolate chips for my daughter’s “Daisy to Brownie” ceremony yesterday and they were DELICIOUS!!! Recipe is perfect as written and very easy to make…didn’t even need a mixer. I will definitely make these again! These really are very good. Recipe has easy measurements, ordinary ingredients which are both pluses in my book. Very little to wash up, also a good thing. They are soooo fudgy. Flour amount is correct, half a cup is the benchmark for truly fudgy brownies (learned that 40 years ago), and not too sweet. Thanks for another great bookmark! I have tried countless brownie recipes and after endless baking I have finally found THE RECIPE. Got fudgy, delicious brownies with that perfect crackly top. Cannot praise them enough! Made them last night and they’re already all gone. Love them! Love these brownies!! This is now my go to recipe. I’ve made them a couple times now and they are a huge hit. So easy to throw these together. What’s not to like? 🙂 Thank you for sharing. Can you clarify if it is 1 and 1/4 cup of butter? I made these for a party, my boyfriend and I ate them all before the party !! Amazing. I added, milk, white and dark choc chips as well as Oreo dairy milk. Thank you! Hello if I were to make these but only have an 8.5in x 8.5in tin how would I need to tweak the recipe please? Thanks. Hi Tracy! No need to change anything, just keep an eye on them after the 25 minute mark 🙂 Enjoy! Thank you for the recipe!! I won a brownie bake off at work with your recipe! They were loved by many!! Hi. These look amazing! Would it work if I use oil instead of butter? Hi Hannah! I’ve not used oil in this recipe, so I cannot say what the outcome would be. Absolutely amazing! I made these yesterday and they’re sooooo good! Thick and fudgy! Will definitely be baking these at every event!